Have you ever stopped at a garden center with seventy plus other fanatical gardeners? And a few head over to that little corner behind the knick knacks and doodads to see what garden tools are offered for sale. With the garden bloggers, I can always count on Anneliese from Cobrahead joining me in looking at the tools. We always look for the most excellent Cobrahead weeders first because it's a sign of a good garden center when they are selling Cobrahead weeders. I can also count on someone shouting out "Hey, Carol, look at the hoes", if I don't make it over to the garden tool corner right away. So it was at Lockwoods Greenhouses, one of our many stops for Buffa10 in Buffalo, NY. They had some garden tools, not a lot, but what they had were very good, and very well-made, tools. Right away I recognized the Cape Cod Weeder, pictured on the left above. I used to have one and I loved it. I loved it so much that the garden fairies took it from me one day just to torment me. I haven't seen it in over a year, so decided to replace it with a brand new one. I was sure that as soon as I brought the new Cape Cod Weeder home and started using it, the garden fairies would return my first one by leaving it out someplace in the garden where I couldn't miss it. Then they'd wait behind some shrubs for me to say something like, "There it is! How's come I couldn't find it before?" "How's come" is because it wasn't really lost... (and "how's come" because we sometimes say that in Indiana). But I digress. Next to the Cape Cod Weeder above is my new Disc Weeder. It was hanging next to the Cape Cod Weeders looking all shiny and sharp, and I'd never seen one before. So I bought it, too. I love using both of them. They are very well made by De Wit Gardening Tools in the Netherlands and should last me for decades, as long as I keep an eye on them and don't let the garden fairies take them. And if they don't last for some reason, they are "guaranteed a lifetime". 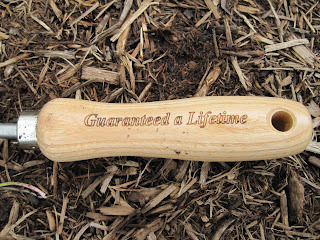 One of the secrets to achieving happiness in the garden is to buy good tools, and with these two good tools added to my gardening tool shed, I'm sure to find all kinds of new happiness in my garden. 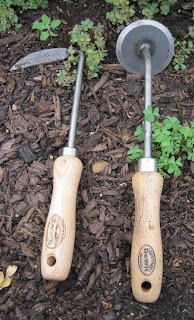 It was fun to watch all the garden bloggers get back on the bus with their bags of plants and gardening doodads, and me with my two new weeders - the perfect souvenirs to always remember the hospitality of everyone in Buffalo and the horto-raderie* of all the garden bloggers! *Horto-raderie is that special camaraderie that gardeners share with one another, based on a common love of plants and gardening. I was so gobsmacked by the variegated Eryngium and the fairy furniture, I totally forgot to look at the tools! I like the look of the Cape Cod weeder, but that other one reminds me of pizza. So you have those pesky garden fairies, too. They always wait to return a 'lost' garden item until AFTER a new one has been bought. Enjoy your souvenirs! I received a tool to test from that same company when I went to OFA Short Course in Columbus. 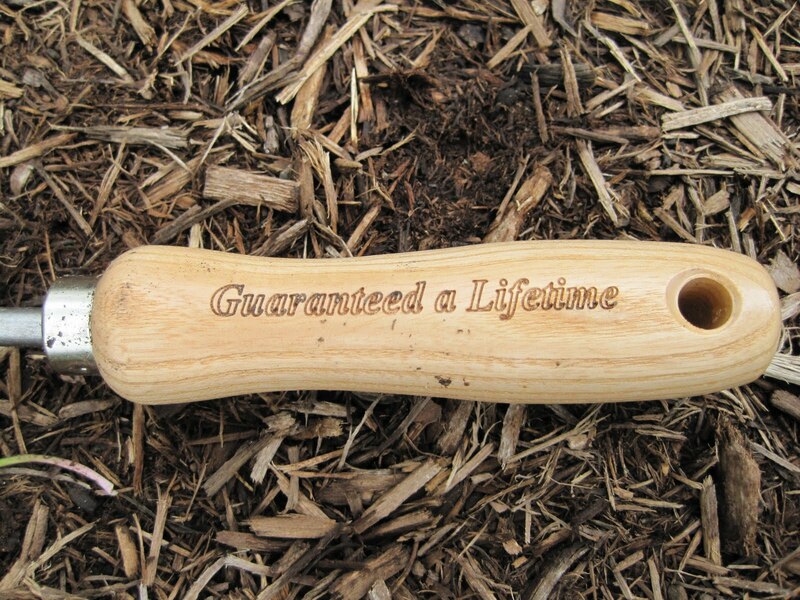 Mine is a three-pronged cultivator with an extended handle and I love it. I bought one of the Cape Cod weeders, too, since I don't have one. I haven't used it yet. It's hanging on a shelf of the etagere in my bedroom, pristine & untouched. The time must be right to bring it into the garden!